The lake of Massaciuccoli, in the province of Lucca, is a coastal lake of Versilia, situated between Pisa and Viareggio, at the foot of the Apuan Alps. A little more than 20km from Villa La Bianca, the lake is famous for hosting the hunting parties of the great composer Giacomo Puccini, who lived for a long time in a villa on the lake itself, in Torre del Lago Puccini. 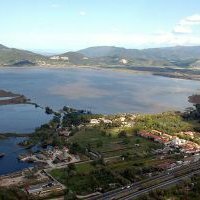 Known in Roman times as the Fosse Papiriane lake, Lake Massaciuccoli is surrounded by a magnificent nature reserve, with which it forms a kind of open-air museum. Among other things, the Reserve is one of the most important Italian ornithological sites, the Oasi LIPU Massaciuccoli, which in conjunction with the Park Authority Migliarino, San Rossore, Massaciuccoli has always been involved in projects of scientific research and environmental monitoring. The visitors, in addition to discovering the wonderful nature reserve, characterized by typical marsh plants and where there are splendid examples such as the marsh harrier and the gray heron, can practice during spring and summer, many sporting activities, including rowing, canoeing and sailing. Of particular interest are the boat rides organized by the environmental guide LIPU. The Lake Massaciuccoli together with the Nature Reserve is the ideal place to spend some time outdoors surrounded by unspoiled nature.